Gardeners with an herb garden usually enjoy fresh herbs all summer long while the herb plants are growing and thriving in the soil. Once you grow accustomed to herbs fresh from the garden, using dried herbs from the grocery store may never again suffice. Before the end of the growing season, a wise gardener will dry some herbs for use over the winter months. Drying herbs in a dehydrator is a fast and simple process. Gather your herbs from the garden early in the day. 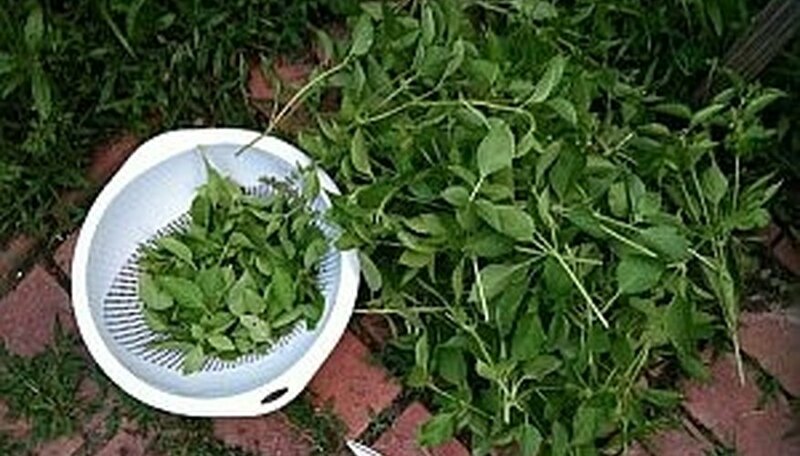 For the most flavorful greens, harvest herbs before the herb plants bloom. Choose leaves from the top of the plant. Snip stems from the plants at a leaf junction. Keep track of the herbs you cut so you know what you are drying. Place the colander in the sink and wash the herbs lightly under cold running water. Shake the colander in the sink to remove excess water from the herbs. Place the herbs in a single layer onto the dehydrator trays. Group the different herbs together and remember where you place the herbs in the trays. Realize that the herbs will change appearance after they dry, and it may be hard to identify them if you cannot remember what the herbs are. Set the food dehydrator to a temperature between 90 and 100 degrees Fahrenheit. Turn the dehydrator on and leave it to run for approximately one hour. Check the herbs to see if they have dried sufficiently after the hour elapses. If the herbs are crisp and crumbly, turn off the dehydrator. If they are not sufficiently dry, run the dehydrator for another hour and check the herbs again. Place each herb variety into a separate plastic food storage bag and label each bag clearly. Remove as much air from the bags as possible and seal them. Store the herb bags in a dry cupboard for several months. Some of the many herbs suitable for drying in a dehydrator include basil, tarragon, oregano, mints, rosemary, thyme, sage, parsley and lemon balm.